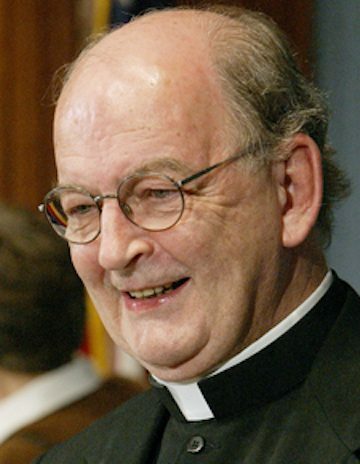 Father Richard John Neuhaus was acclaimed as one of the foremost authorities on the role of religion in the contemporary world. He was President of the Institute on Religion and Public Life, a nonpartisan inter-religious research and education institute in New York City. He was also editor-in-chief of the Institute’s publication, First Things: A Monthly Journal of Religion and Public Life. Neuhaus was a graduate of Concordia Theological Seminary. As a Lutheran pastor, Neuhaus served close to two decades as senior pastor of St. John the Evangelist, a racially mixed urban congregation in Brooklyn, New York. He played a leadership role in organizations dealing with civil rights, international justice, and ecumenism. Neuhaus’ work has been the subject of feature articles in popular and scholarly publications both here in the United States and abroad. He has been the recipient of numerous honors from universities and other institutions, including the John Paul II Award for Religious Freedom. Neuhaus held presidential appointments in the Carter, Reagan, and first Bush administrations. In a survey of national leadership, US News and World Report named him one of 32 “most influential intellectuals in America.” In September 1991 he was ordained a priest of the Archdiocese of New York. Among his best known books are Freedom for Ministry; The Naked Public Square: Religion and Democracy in America; The Catholic Moment: The Paradox of the Church in the Postmodern World; and, with Rabbi Leon Klenicki, Believing Today: Jew and Christian in Conversation. He authored and co-authored several other books including America Against Itself (1992); Doing Well & Doing Good: The Moral Challenge of the Free Economy (1992); The End of Democracy? (1997); Appointment in Rome: The Church in America Awakening (1998); Evangelicals & Catholics Together: Toward A Common Mission (1995, co-edited with Chuck Colson); The Eternal Pity (2000); Death on a Friday Afternoon: Meditations on the Last Words of Jesus from the Cross (2000). Can an Atheist Be a Good Citizen?